bitcontrol® Audio/Video Decoder stands out becasue of its extraordinary color brilliance. It is based on 4:2:2 color upsampling and on exact color spreading during decoding for MPEG-2. bitcontrol® Audio/Video Decoder is a part of bitcontrol® Multimedia Suite. It is a multifunctional multiformat decoder for different multimedia formats, e.g. MPEG-2, H.263, MPEG-4, H.264/AVC, and others (see specification). The decoder provides a decoded image sequence in a defined chroma format for displaying on the screen. Also, the output signal can be transcoded or otherwise processed. bitcontrol® Audio Video Decoder is used as a component in programs such as bitcontrol® Simple Player, in bitcontrol® Video Streaming Server, in the Recorder plug-in and in other Windows Media® applications for the decoding of compressed video and audio. 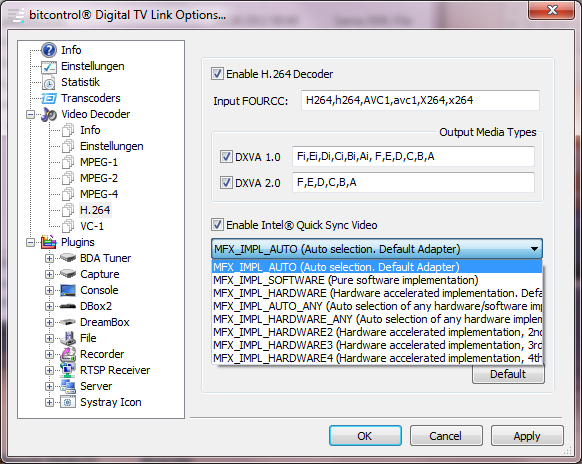 The decoder supports DVB-TV, media files, WebCams, video streaming and other input types, depending on the connected front end demultiplexer. The decoder is optimally tuned for interacting with bitcontrol® Digital TV Link. bitcontrol® Audio/Video Decoder is a loadable COM object under Windows, not a stand-alone program. Usually, a multimedia application loads bitcontrol® Audio/Video Decoder automatically, so the user does not need to take care of anything. bitcontrol® Audio/Video Decoder operates as a software decoder for different codecs in accordance with its specification, in addition it supports DirectX® Video Acceleration - DXVA. High definition TV HDTV with 1080i definition can be played with DXVA on Celeron <1GHz and with common atom processors. bitcontrol® Audio/Video Decoder is delivered with a separate configuration menu, making it easy and convienent to set the supported codecs and their parameters.